The BCR is composed of two protein modules, the membrane-bound immunoglobulin (mIg) molecule and the Ig-a/Ig-P heterodimer, which mediate antigen binding and signaling, respectively (Fig. 1A) [2,3]. The proper assembly between the mIg molecule and the Ig-a/Ig-P heterodimer in the membrane of the endoplasmic reticulum is a prerequisite for the transport of the BCR to the cell surface. All five major classes of mIg (mIgM, mIgD, mIgG, mIgA, and mIgE) are associated with the Ig-a/Ig-P heterodimer, presumably in a 1:1 stoichiometry. In the case of the IgM- and IgD-BCR, evidence suggests an oligomeric organization of the BCR . These data support the model that conforma-tional changes within oligomeric antigen receptors lead to initiation and amplification of the BCR signal (see below). Figure 1 The BCR, its early signaling elements, and an ITAM-mediated positive feedback mechanism. (A) The BCR is comprised of the membrane-bound immunoglobulin molecule (mIg) and the Ig-a/Ig-P heterodimer, which are responsive for antigen binding and signaling, respectively. 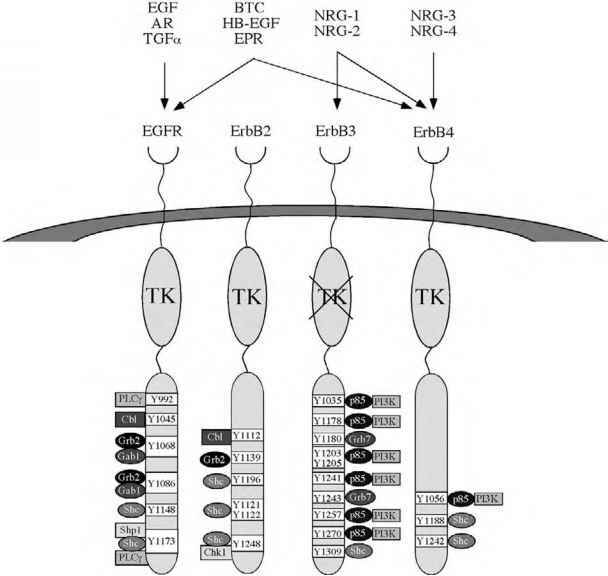 The early signaling elements of the BCR signal transduction machinery are the tyrosine kinases Syk, Lyn, and Btk, as well as the tyrosine phosphatase SHP-1 and the adaptor protein SLP-65. (B) Syk in its closed conformation is able to slowly phosphorylate the ITAM tyrosines. 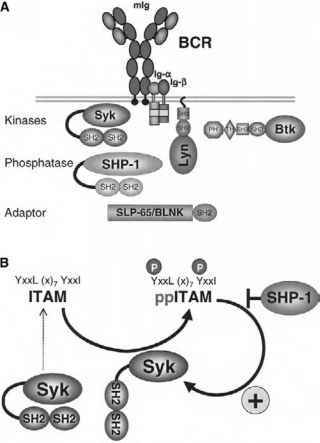 Once dual-phosphorylated, the ITAM can be bound by Syk via the two Syk SH2 domains, resulting in stabilization of Syk in its open, active conformation. Active Syk can now amplify the initial signal by phosphorylating further ITAMs within the oligomeric BCR complex, thus establishing a positive feedback. SHP-1 can stop the positive feedback of Syk and the ITAM by dephosphorylating the ITAM phosphotyrosines. activation motif (ITAM), which is also found in other receptors of the multi-subunit immune recognition receptor (MIRR) family and has the following consensus sequence: D/ExxYxxL(x)7YxxL/I. The two tyrosines in the ITAM sequence are phosphorylated during activation of the BCR and become a binding-target for interactions with signal-transducing elements.